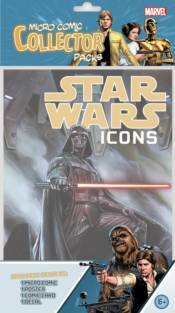 The Star Wars Icons have returned! This brand new Micro Comic Collector Pack series celebrates the launch of the new Marvel Star Wars universe by collecting six issues celerbrating some of the biggest names from a galaxy far, far away including: Darth Vader, Princess Leia, Luke Skywalker, Lando Calrissian, Obi Wan Kenobi, and Chewbacca! Each pack contains either a first issue or a stand-alone story focused around one character, as well as a poster, comic cover card, and a Star Wars: Icons decal. Celebrate your favorite character or collect the entire set! Each Pack Contains: � 1 of 6 Star Wars micro comic replicas of the new ongoing Marvel Star Wars comics. � 1 of 6 Star Wars posters. � 1 of 6 Star Wars comic cover card. � 1 of 6 Star Wars: Icons decals.